Since starting piano lessons at the age of four, Branwen has spent much of her life thus far studying music in its infinite forms. Her years guided by piano, guitar, bass and percussion teachers combined with an honours degree in Popular Music & Recording and an intensive and varied career in the music industry have lead to Branwen now being committed to passing on her knowledge, helping learners of all ages achieve and expand on their musical potential. 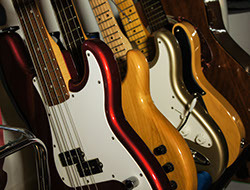 Branwen currently offers affordable one-to-one tuition on piano, acoustic guitar, electric guitar, and bass guitar. Her approach varies depending on the individual, and she is happy to guide students through the various graded exams offered by the Associated Board (ABRSM), Rock School or the Registry of Guitar Tutors (RGT) if required. 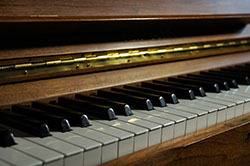 GCSE and A-Level students often benefit from lessons with Branwen as she can offer support in preparation for performance exams and guidance on improving composition work. As well as instrumental lessons, Branwen is also available for tuition covering the many aspects of Popular Music production, from recording methods, sequencing, synthesis, sampling and mixing. A successful freelance career in London as a sound engineer/producer/arranger followed by eight years experience teaching Music Technology A-Level have lead to Branwen combining her acquired skills with her own carefully developed resources in this field. She can offer bespoke tuition tailored to suit the needs of any learner. Starting with Media Studies A Level and continuing with her many and varied experiences in the world of moving image, Branwen has developed an effective range of approaches to film-making on a budget. 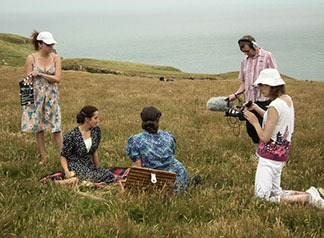 Using accessible methods to create low cost, digital film and video work with a professional look, Branwen has produced a diverse showreel (see the Film & Video section of this website). She is now excited to offer workshop courses for all ages exploring ways to get the most from even the most basic equipment and software. Covering the concepts of visual story-telling and conveying meaning, from the foundation of writing a screenplay right through to the final stages of colour grading and soundtrack composing, her inclusive approach is designed to empower anyone with an interest in film-making. Everyone has the potential create something outstanding! The dawn of the 21st Century is an exciting time for 'do-it-yourself' film directors. Don't miss your chance to be a part of the creative fun! 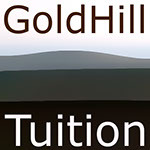 If you'd like to find out more about any of the tuition offered by Branwen, please don't hesitate to contact GoldHill, either by phoning 01239 711776 (leave a message if no reply!) or by using the 'contact' link at the top right of this page. Branwen is very happy to discuss and design custom tuition to suit you.